Built in 1990, Target Center became the home of the NBA’s Minnesota Timberwolves. Its unique location, in the middle of downtown Minneapolis, is part of what makes the arena so special. 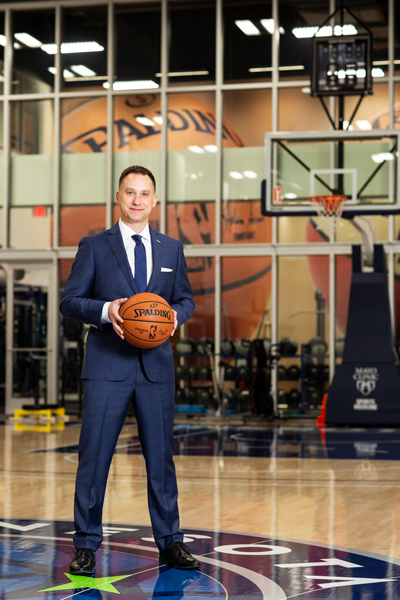 So, after nearly thirty years, when the team began to discuss a venue upgrade, chief revenue officer Ryan Tanke says, the idea of finding a new home for the Timberwolves (and the WNBA’s Minnesota Lynx) didn’t sit right. Instead, an extensive $145 million renovation of the arena was initiated (and completed in 2017), which has not only updated the aesthetics of the arena but also taken advantage of new and existing partnerships to make what Tanke believes are immeasurable strides in fan experience, food and beverage offerings, and collaborative and enduring sponsorship opportunities. Tanke says the timing of the renovation couldn’t have been better. The team’s new training facility and Mayo Clinic Square, built in partnership with the Mayo Clinic, had just been completed directly across the street from Target Center. “To own a two-block campus in the heart of downtown gives us a competitive advantage in recruiting staff and players,” Tanke says. “You do that with perhaps the most iconic healthcare provider in the world, and it becomes a really compelling story in downtown Minneapolis.” Traditionally, teams will head to the suburbs to build training facilities, but Tanke says the all-in-one location provides both players and staff a unique feeling of always being home. That home has had Target’s name since it was first built, and Tanke says the renovation gave the team and the retail giant a chance to realign around what the future of their relationship would look like. “Target does such a great job with guest experience in their stores,” Tanke says. “We wanted them to have a front-row seat in the renovation of Target Center that we imagined could be.” Target actually has the longest-running naming-rights partnership to date on an arena, and its streak will continue now that it has reached an agreement for a long-term extension with the Timberwolves. After naming partners were solidified, Tanke says, there was a significant opportunity to use the renovation to create what the organization calls founding-level partnerships. “It’s a way for us to take a less-is-more exclusivity approach to partnerships,” he says. Local insurance provider and longtime partner Federated Insurance, partner US Bank, casino partner Treasure Island Resort and Casino, and China-based TCL, the fastest-growing TV brand in the US, were secured early on. Jack Link’s also came on board and ultimately wound up moving 350 of their executives to Mayo Clinic Square office space. Life Time Fitness, headquartered in Minneapolis, maintains a flagship club underneath Target Center and also made significant investments in the team. The NBA’s jersey-patch program, which allows advertisers to partner with teams via a 2.5 by 2.5 inch patch on team uniforms, has been a huge revenue success for the league, and it provided an additional brand-partnership avenue for the Timberwolves during the renovation. Minneapolis-based chef David Fhima was hired to work in conjunction with partner Levy Restaurants to redesign the arena’s menu from scratch. Fhima had previously helped develop Life Time Fitness’s Life Café concept, and Tanke says the additional work the chef has done for the team’s player nutritional program as well as for a nearby restaurant has made him a well-rounded partner. Tanke, who got his start on the Timberwolves ticketing team in 1997, is especially proud that the Timberwolves and the Lynx became the first teams to move exclusively to digital ticketing. About 90 percent of fans now enter using just their smart devices, and the move to digital tickets has eliminated the need for will-call space entirely.